First of all, Montgenèvre is a genuinely charming village, with an 18th century church and a Napoleonic obelisk inaugurated on 12 April 1804. It has wooden fountains and narrow, cut-throat alleyways… We’re very far from the modern mountain style adopted by most ski resorts around the beginning of the 1970s, and which they’re now finding so hard to get rid of! OK, the hotels may sometimes be a little bit noisy, not very well insulated and somewhat run down, and you have to pay to park, but it’s a great village overall, with good sunshine and snow conditions, long and varied ski runs, well-maintained ski infrastructures and friendly and welcoming service providers. Around 1900, French alpine ski club enthusiasts and keen military skiers were concerned by the fact that the local population showed little interest in this sport, unlike the Swiss. Around the turn of the century, in 1907, they decided to organise the first international ski competition in Montgenèvre to incite more people to take up skiing and develop greater enthusiasm for the sport. Several European nations took part in the tournament, which included cross-country skiing, downhill skiing and a jump. Three thousand people signed up and the great cross-country skier, Durban Hansen, even made a 26-metre jump to the spectators’ amazement. On 11 February 1907, the resort entered French skiing history when, thanks to this first international competition, it was officially recognised as an international ski resort. It’s true that Montgenèvre has a head start compared to a lot of other resorts, which goes some way to explaining its special charm. 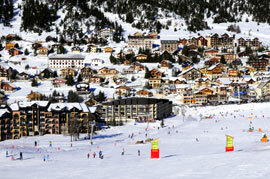 It is in fact the oldest French ski resort and even celebrated its hundredth anniversary in 2007. It may have a few wrinkles, but the infrastructures are still good and breakdowns are both rare and short-lived, grooming is reliable, and man-made snow makes up for any shortfalls and guarantees that you can get down to the station on skis at all times during the season. For pole and slalom enthusiasts, the Prarial international slalom stadium meets all the FIS standards, with an excellent run marked out in the heart of a larch forest, facing the village. It’s a quietly competent, average-sized resort with a hundred or so kilometres of pistes that has been dealing with skiers and skiing for a long time ski. Montgenèvre is part of the Franco-Italian Milky Way ski area, or the Via Lattea in Italian. It covers Clavière, San Sicario, Cesana, Sestriere and Sauze d’Oulx, with a grand total of 400 kms (250 miles) of ski runs and 91 ski lifts. Montgenèvre is the gateway to this group of resorts, and owns the lion’s share with 37 ski lifts and around 100 kilometres of pistes, all just two short kilometres from the Italian border. So, at an altitude of 1860 metres, Montgenèvre has a lot going for it. It sits on a welcoming high plateau with two facing slopes, the old village at the bottom where the pistes meet, and a panoramic view of the surrounding peaks. There’s a really friendly atmosphere and you’ll find yourself falling under the spell of this charming village, even if the bread isn’t brilliant! The best surprise in Montgenèvre is probably its off-piste ski area. The local off-piste area lies between the Hautes-Alpes and Italy, with plenty of snow and lots of sunshine most of the time thanks to the influence of the Mediterranean climate. The backdrop features the mountains of the Massif des Ecrins and Monte Viso, which you can see emerging from the horizon of snow-covered peaks. Some freeride areas are cordoned off by the ski patrol but most of the ski area has kept its virginity. The best-known ride is the Vallon de la Vachette, which begins at the top of the resort and ends in the forest below. More accessible, keen geologists will love the Vallon de Doire near the volcanic massif du Chenaillet. You’ll find the steepest slopes at the top of la Plane between Piémont and Briançonnais. The great classic, the Rocher de l’Aigle is a superb valley, which is ideal for your first attempts at off-piste skiing. And anyone looking for a long downhill run that’ll make your thighs burn should try the descent from Cervières, beginning at Les Gondrans. This is obviously just a short list to give you an idea of some of the many options! Although it’s been banned in France, heli-skiing is still authorised in Italy. The ski schools in Montgenèvre can organise half-day outings with Italian operators for those who want to give this adrenalin-boosting sport a try. This high alpine resort would like to join the very closed club of resorts which culminate at 3000 metres via the creation of a new ski area around Mont Chaberton, located on the French-Italian border. 26 million euros are being invested in the project which should be completed in 2012/2013. At the same time, Montgenèvre is developing a new district, the Hameau de l’Obélisque, which should boost Montgenèvre’s popularity with the younger generation. Since the opening of the new Serre Thibaud sector a few years ago on the Chalvet slope, almost 55% of the area now uses snow guns to guarantee good snow coverage. The very high investment (over €21 million in 2007) has enabled it to modernise some of its equipment, and improve the comfort and flow of skiers per hour, significantly reducing the queues of skiers. Given its high maintenance costs, the size of the area and the off-piste opportunities, ski pass prices are relatively good value, at the lower end of the scale. €32.50 for a full day adult ski pass (between 15 and 59 years old). The Montgenèvre Mont de la lune ski pass costs €35.50. The Vialattea ski pass for 400 km of pistes costs €44 (single price). If there’s a lot of snow, don’t forget the snow chains! While it usually takes just under 20 minutes from Briançon to the resort, you just need one car in trouble along the way and it’s total chaos as it’s impossible to get past those bits of narrow mountain road with their pretty abrupt hairpin bends. Driving is not really recommended in the particularly narrow streets of Montgenèvre itself: it’s better to walk once you’ve managed to park in one of the many car parks. Anyway, everything in the village is within walking distance. Avoid the baker’s just at the bottom of the ski slopes and go instead to the snack bars and restaurants in front of the Espace Partenaires. The Petit Creux makes excellent paninis, the Graal does a good meal at €13, served quickly and with a smile. If you want to eat Italian, then your best bet is the Capitaine, run by a true Italian. Montgenèvre has earned the Famille plus montagne certificate, a renowned family-friendly mountain resort seal of approval. Find out more about the special offers available from the Tourist Information Centre. Check out the local snow conditions, maps of ski pistes, reviews, prices of passes and holiday rentals in our ski resort guide.